A lot of people say this is BAD. Even worse than the 1/2 stars only Ah Long Pte Ltd. How can it be? There is only 1 way to find out. I have no choice but to watch this in chinese here. One thing I must say is that this is not as funny as his previous movies. This is a quite serious movie. Stephen Chow no longer plays the “hero” or even the main character in this movie. In fact, the movie was pretty sad at the end. Maybe that is why many people find this bad. Their expectation was complete wrong. But I find that this is NOT a bad movie. I haven’t watch Ah Long Pte Ltd and do not intent to waste $8 watching it in the cinema. But I seriously think people should set the expectation right before going into this one. This is close to the E.T. type of show, a bit of jokes here and there, but generally serious. The main characters are from a very poor family and many of the things I find people laughing all over are in fact quite sick because everyone here live in luxury (at least have the $8 to enjoy this show in the cinema). But in fact, such family (and even worse) do exist. That is probably me thinking too deeply into it. 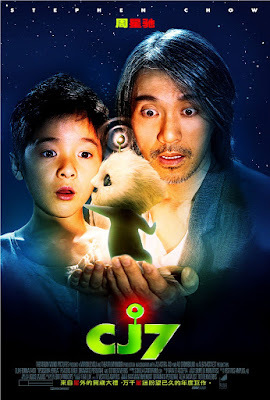 CJ7 is cute and if there is such a thing, I won’t mind queuing overnight for it. That for sure. I would advise you to go watch it, but prepare youurself. Do not expect to laugh until you have a stomachache. Expecting something a bit more meaningful and bring something back for thoughts. There are quite some “punch” at various other movies as well, so it definitely is good if you had watched them.